Clear masonry sealer is a valuable product, used to protect brickwork, stone, and stucco from excessive moisture. Sealants also enhance the color of masonry, prevent it from fading, and make it easier to clean. Many problems, like concrete spalling (breaking apart into big chunks) are caused by excess moisture expanding and contracting as the weather changes. Sealed surfaces are less susceptible to this type of damage. Masonry sealers are divided into two general categories; acrylic, or water-based, and solvent-based. Both types can be applied to brick, stucco, stone, concrete, or cinder blocks. It’s important to understand that a sealer will not provide true waterproofing. Instead, expect it to repel water, causing it to bead up. It also allows water vapor to move through the masonry material. Like all acrylic-based products, acrylic masonry sealers can be cleaned up with soap and water. They are low-odor, require no mixing, and are the best choice for beginners. In addition, acrylic sealers can be applied to damp surfaces. Many are tintable; check the label. Acrylic sealers typically need to be redone every year or two. Solvent based clear masonry sealers generally have a mineral spirit base. They are strong smelling and usually don’t qualify for the low VOC label. 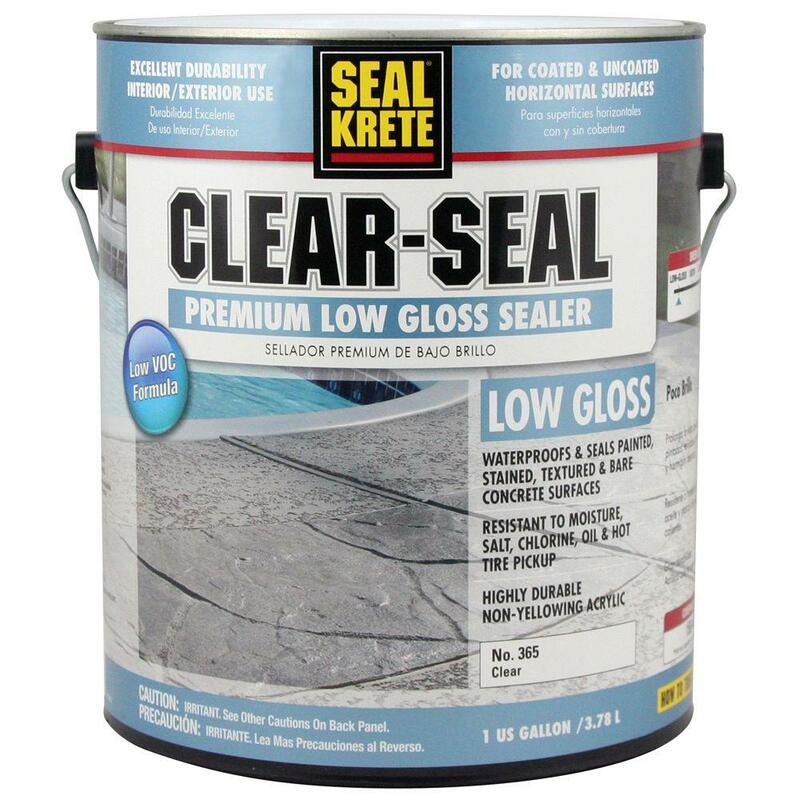 Use these types of sealers in well ventilated spaces and protect yourself further by wearing a mask or respirator. Depending on the formula, solvent-based sealers may come as two components that must be mixed together before use. In general, solvent-based sealers are more durable than acrylic ones, because they have more penetrating power. Expect them to last five to seven years. For a true waterproof surface, you’ll need a specially formulated waterproofing masonry sealer. These are used in swimming pools, basements, and other wet areas to prevent damage and erosion before it begins. Waterproofers can also be used to seal areas already damaged by moisture; be sure to remove any mildew or salt buildup before applying it, or it may not adhere well. Masonry waterproofers are available clear, tinted, or film-forming. The film-forming solutions typically last the longest; they provide a film that resists water pressure. Film-forming sealers, when dry, look like a painted surface. Like paint, clear masonry sealers and waterproofers are available in a variety of finishes from matte to glossy. Matte finishes are the most natural looking and won’t alter the appearance of the substrate. Glossier finishes create a wet look, deepen the color of the masonry, and are easier to clean. Stop basement walls from leaking with a film-forming waterproofer. Seal brickwork around fireplaces to make soot buildup easy to wash away. Seal stone floors and counters to prevent unsightly stains from forming. Outside, clear brick sealer can form a barrier that will prevent weeds from growing in gaps between bricks and flagstones. Seal sidewalks to prevent discoloration and retard cracking. Seal swimming pools and fish ponds with waterproofer. Use clear sealant as a stucco sealer to preserve the color and texture of the finish. Clear masonry sealer can be used on all types of masonry. This includes stucco, brick, rock and rock veneer, concrete, and cinder blocks. Some brands are formulated to be applied to both vertical and horizontal surfaces; others should be used on horizontal surfaces only. Check the label before buying.